It was a first at Dallas-Fort Worth International Airport, and not one to celebrate. Acting on a tip, agents with the federal Drug Enforcement Administration intercepted from a commercial passenger plane two suitcases containing fentanyl – one of the most dangerous drugs in the world. 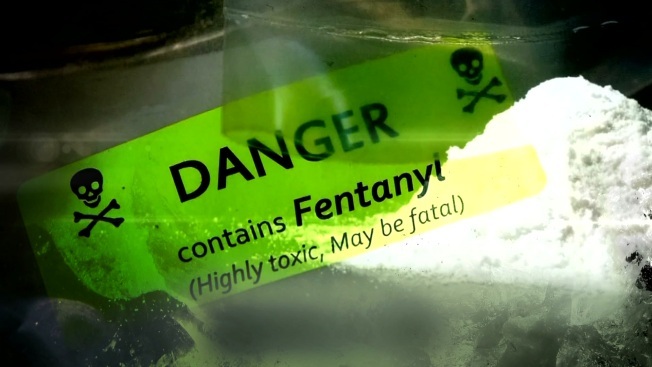 Even a small dose of fentanyl, about size of a few grains of salt, may be enough to kill an adult exposed to it, said Clyde Shelley, special agent-in-charge of the DEA's Dallas division. Asked if it could pose a deadly threat on board a passenger plane Shelley responded, "Yes, absolutely." The tip came in last month that a passenger was on an inbound plane from Phoenix, along with two suitcases containing the drugs. DEA agents raced to prevent the passenger from boarding a connecting flight. "You don't hesitate, because that is a risk to the public. That is something you have to move on, and we did," Shelley said. In the bags agents discovered nearly eight pounds of heroin, mixed with fentanyl – a drug 50 to 100 times more powerful than morphine – hidden beneath false floors created in the two suitcases. When DEA agents are exposed to fentanyl, they prefer to wear chemical protection suits, as NBC 5 Investigates saw in 2016 when, in a separate case, they raided an apartment complex in Lubbock. Some studies suggest small amounts of fentanyl have to remain on the skin for some time before it becomes deadly. But other research has shown fentanyl may pose a bigger threat in a poorly ventilated environment. And a pressurized passenger plane is one of the worst places for fentanyl to land, Shelley said. "It's a confined space. You have your baggage handlers. You have your people coming in and out of the cargo hold," he said. Once air travel security tightened after the Sept. 11 attacks, drug traffickers backed away from using commercial flights to make their drug runs. But they seem to be returning, resulting in larger illegal drug seizures being made recently at the airport, the government said. "It's a challenge. But it is something we can't afford not to address," said Shelley. Agents were told it was not the first time the passenger from Phoenix had used a commercial flight to move fentanyl. And it likely won't be the last time money-hungry traffickers take such risks, agents said, putting innocent passengers in harm's way if fentanyl seeps through packages, or if it ends up on the outer surfaces of luggage when it's loaded into the bags. Agents also fear traffickers eager for profits might be tempted to put fentanyl in carry-on baggage, increasing the risks to people on board. "We try to screen for that at the airports," Shelley said. "But with people wanting the profit, someone may try it."